Yesterday was staff day at work. 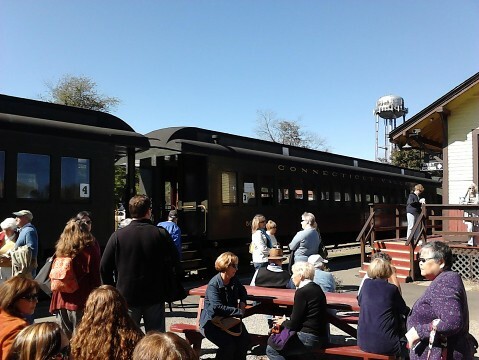 We went, by donated careening bus ride, to the Essex Steam Train & Riverboat. We did not get a ride in a steam-powered seaplane, but the combination of bus, train and boat was pretty entertaining. More sitting than most of us care for; one member of our party said, “This is an old person’s tour–it’s all sitting.” She’s practically a professional shopper, so she’s good on her feet in fairly high heels. But what struck me, standing by the platform at the station is Essex, was that we were in a museum of transport past, and that it was somehow very strange to be in a place that historicized a means of getting around that many people still use every day. Except for the 6 tons of coal part, my husband takes the train to Boston every day, and has for more than 10 years. And when we first moved back East, I rode the train, too. In the dark ages of grad school, I commuted by rail. The last year at RISD, I had a job in Natick, MA, teaching at a boarding school as a visiting artist, and the question was, how to get there? The answer was easy, the MBTA of course. I took the commuter rail to Back Bay or South Station, caught the Framingham line out to Natick and walked up the hill from the station to school. Sometimes I’d get there early enough for lunch, and pack extra grilled cheese sandwiches into my tool bag. I liked the train commute and some of my favorite memories of pulling into Providence are from that year. The conductors were more lax, then, and would let me ride in the vestibule with them while the car door was open, watching the sunset over the west side of town. This was pre-Home Depot and Providence Place Mall and the 6-10 connector, pre-development along Royal Little Drive, pre-development in Pawtucket, so the view was a lot better. The Citizens Bank building was still under construction, it was just a steel frame that the sun would shine through at the end of the day. That never happened, but when I got the job in RI, and we moved east from St. Louis, my father was working in Boston and New York, but living in Noank, CT, just down the road from the little house. Providence was 45 minutes away by car, but Mr S and the Young Mr (then known as the Monkey) needed the car to get anywhere outside of Noank. The grocery wasn’t very big there and they needed to be able to get into Groton and Mystic, so how was I to get to work? On the train. I took Amtrak from New London to Providence, and the train would get in around 9:10 (supposedly) and end up back in New London around 6. There were schedule changes, and the bridge at Old Saybrook tended to freeze, and there were coworkers who didn’t get me to the station on time, and evenings spent at the RISD Library on the laptop waiting for the next train. It worked out, though, since I was writing a book at the time. The monthly pass that was definitely cheaper than driving, and I walked around Providence when I needed anything. The conductors all knew me, and were very kind. Here’s a tip: be nice to the conductors, and you can ride free if you forget your pass. I’ve even gotten free trips to Boston when they were on duty. The view from the window was pretty much the same, though now there were McMansions and condos in Stonington. The wetlands were still there, and the coves, the nesting raptors and the shore birds. One morning I even saw a harbor seal swimming in a cove, whiskers poking up above the surface. That is definitely the coolest thing I’ve ever seen on a commute. And then there was a museum to set all that in the past, as if to say that way of life is over. The train we were on was truly steam-powered, and that is a thing of the past. The car was from 1914, with seats that switched direction, though I remember riding on seats like that either on the MBTA back in the dawn of time, or else in Chicago. What will I do next? Why, make a 1914-1919 traveling costume and go back to Essex to ride the train again, of course. Might as well be a museum exhibit if you’re going to travel temporally.